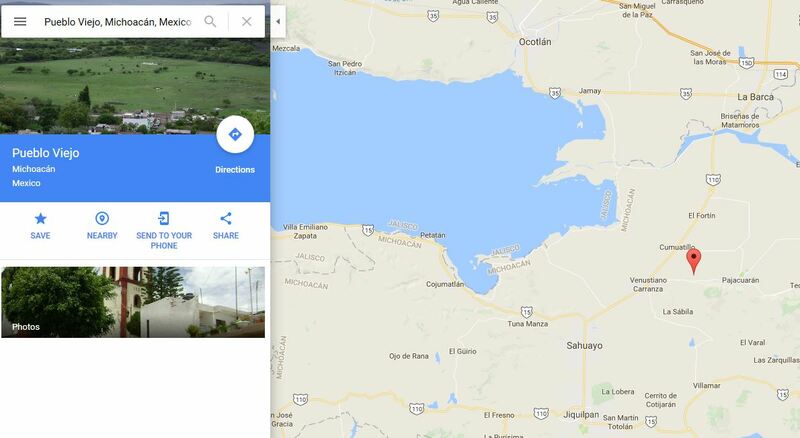 There are press reports of red-hot rocks emerging last weekend at a location known as “Pueblo Viejo” in the municipality of Venustiano Carranza in the state of Michoacán, a short distance east of Lake Chapala. That location is not far from the famous mud volcanoes, “Los Negritos” at Villamar, described in chapter 6 of my book Western Mexico: A Traveler’s Treasury. Note: Please note that this is an on-going event; this post will be updated and, if necessary, rewritten, as further information becomes available. The reports say activity began on Saturday 8 July 2017. Cracks and fissures have appeared in the middle of a soccer pitch in Pueblo Viejo, and smoke, vapor and red-hot rocks emitted. Some reports refer to two goats having been found burned to a crisp, and say that subsoil temperatures up to 250 degrees Celsius have been recorded. Expert geologists are on their way to assess the situation and try to determine the cause and potential impacts. Panic over! Geologists from UNAM have discounted the possibility that this is the birth of a new volcano and determined that this is a “geothermal fault” giving rise to a phenomenon that is more similar to the fumaroles found in some areas where volcanoes were previously active. The Lake Chapala area is part of Mexico’s Volcanic Axis which was very tectonically active millions of years ago. The most famous new volcano in historic times is Paricutín Volcano, located further east in Michoacán. Parictuín was active between 1943 and 1952. 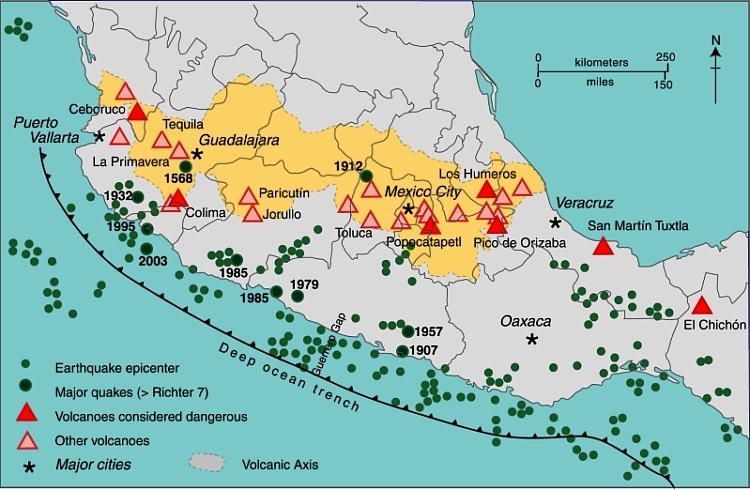 Mexico’s Volcanic Axis (Fig 2.2 of Geo-Mexico, the geography and dynamics of modern Mexico. All rights reserved. Sorry, but I think the most famous new volcano in Mexico is EL CHICHONAL, in the state of Chiapas. My use of “new volcano” meant a volcano not previously known. El Chichón(al) – http://geo-mexico.com/?p=6256 – was certainly known to exist, and it was known that it was a volcano, from well before its unexpected eruption in 1982. However, Paricutín was a completely new volcano because it certainly did not exist prior to 1946 when it started to erupt in Juan Pulido’s field! Tony, Paricutín first started to erupt on February 20, 1943. For at least two weeks before the wisp of smoke in don Juan’s milpa became a roaring presence, townspeople in San Juan Parangaricutiro had felt (and heard) deep rumblings in the earth, not unlike a loud earthquake. On this page, you’ll a wonderful photos and a short documentary about the origin of volcano Paricutín. I just found this website for the first time. I am posting to say I find the various entries fascinating! So much data, intelligently written, with a little humor and enlightening social insights. I have put the book on my Christmas wish list. –smiling, but true–. I’ll keep reading. Thank you! Thank you for your very kind words. The site is currently “in hibernation” while I work on other equally-exciting projects!